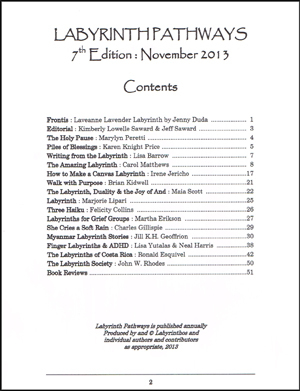 Labyrinth Pathways is published annually by The Labyrinth Society, and all TLS members can access digital copies via the member section on the TLS website. This publication is intended to reflect the diverse ways in which the labyrinth is used and loved today. If you have a labyrinth-related piece of writing suitable for publication, whether essay, poem, or article, please submit it as soon as possible to the editors, Kimberly and Jeff Saward, for consideration for the forthcoming ninth edition. Deadline for submissions has been extended to August 31, 2015. NOTE! Please send your text as an attachment in Word document format. Photographs and illustrations are also welcome to accompany your text, although please mark your preferred position for the illustrations and then send these as separate attachments, not embedded within the text. Please contact the editors for questions about Pathways.